Here's my vote for Java 6 on Mac OS X Leopard! My first book review for Javalobby was published today! This year, I'll be taking part in JDRF's Walk to Cure Diabetes, along with one-half million other walkers across the country, as we try to reach our goal of raising $90 million. Type 1, or juvenile, diabetes, is a devastating disease that affects millions of people - a large and growing percentage of them children. One of them is my oldest daughter, Abby, who is three years old. Since Abby's diagnosis, she's had her fingers pricked over 800 times already. She's received more than 200 shots in her arms, legs, and tummy. Over the course of her life, she'll continue to receive daily insulin injections and finger pricks. She must take insulin to stay alive. We must constantly monitor her glucose levels to ward off complications such as blindness, kidney failure, and stroke. Abby must maintain strict control of her diet every day (even on birthdays and holidays), check her blood sugar at least 6 times a day, and take insulin at least twice a day. There is some good news, though. For the first time, scientists are predicting that we CAN expect to see a cure well within our lifetime! This is exactly what we're wishing for, so we've formed a team called "Wishing With Abby," and we'd love to have your help. I've been wanting to post a picture of my new work setup for awhile, but I wanted to wait until I finished getting setup over at 160 Shadyac Avenue. Just for fun, I thought I'd go VMWare Fusion crazy and boot up every virtual machine I've got - you're actually looking at 7 OS's booted concurrently between two machines. To the left I've got my 15" MacBook Pro (2.2 GHz Intel Core 2 Duo processor, 4 GB 667 MHz DDR2 SDRAM) running Mac OS 10.4, Windows XP, and Ubuntu. To the right I've got my Mac Pro tower (2 x 2 GHz Dual-Core Intel Xeon processors, 5 GB 66 MHz DDR2 FB-DIMM RAM) driving the dual 19" Dell LCD's, running Mac OS 10.4, Windows XP, Ubuntu, and Solaris Express. Whew - that was a mouthful. Thanks to Matt Raible for blogging about the Griffin Technologies iCurve laptop stand - I picked up its successor, the Elevator, for my MacBook Pro. I've got pictures from my past desktops over the years - I need to dig them up and show the procession of developer technology here. It's been quite a ride from my first system as a junior developer six plus years ago. Recently I was faced with the challenge of implementing form-level (or page-level) validation in a JSF-based application. What I mean by form-level validation is the need to evaluate a subset of a form's fields as a unit, rather than simply validating each field in isolation. An example of this type of validation can be found on a user registration form where one has to select a password in one text field, and then retype the same password in another text field for confirmation. Validating that these two text fields contain the same password is an example of form level validation. In my case, I had two date selector components on my form, one for a start date/time and one for an end date/time for an event that was being scheduled. The rule I needed to validate was that the end date/time was later than the start date/time. Build a custom component that renders selectors for both the start and end date/time, then validate as a unit. This actually is field-level validation and doesn't truly address the form-level problem. Implement a validator method on a managed bean that will evaluate the data submitted for multiple components. I'll address the second method in this HOWTO. To understand why I say n-1 components, think of the way the validation phase occurs in JSF. Data is bound to the components in the order that they occur in the JSF component tree, which just so happens to be the order in which they appear in the JSP source. Looking at the validateEndDate method, you'll see that I only reference the startDateComponent from the binding, but I reference the endDate as the Object value reference that was passed into the method. This is why you only need to bind n-1 components, because you get the nth component from the method signature. If you want to be more uniform and bind all of the components, you could create an extra dummy hidden value component and bind the validator method to it. You could then bind all of the components to your managed bean and access them all from the bindings rather than accessing one from the method signature. The validateEndDate method itself is rather simple. First you access the data by getting the local value of each component (again, the endDate value is not accessed in this way - in fact, it hasn't been bound yet because it must be validated first, and that's what's happening in this method!). You then apply the business rule. You'll see that first I look to see if the startDate is null. I'm not sure why this is possible, but if the startDate was not submitting a good value on the FIRST submit, the local value was null. So, I catch that here. I add an error message to the startDateComponent and throw a ValidatorException. If the business rule is violated, throw a ValidatorException. (I'm also using the addError method provided by AppFuse to work w/ its message framework as well, but that is not necessary w/ all JSF apps). Now, for the final problem I encountered. In Weblogic server, which we're still using for the time being, if your session cannot be serialized then it deletes your entire session. Obviously this can cause major problems in any web app. To deal with this, ANY SESSION SCOPED MANAGED BEAN must be fully serializable, meaning it and any objects referenced in its state. Herein lies the problem for JSF. Instances of UIComponent (an ancestor of UIInput) are not serializable, so if we bind our components to UIInput fields on a session-scoped managed bean (the bean backing this form is an Order Form/Shopping Cart style bean), it will not be serializable and Weblogic will kick out your session. The added bonus is that you can reuse this bean across all forms where you need this behavior. My application happens to have 2 additional forms where I would have repeated this logic, so I just reference this bean there. The Grove Coffee House Rocks! It's Friday night, and what am I doing but coding. My wife's night out is spent at the scrapbook store working on her latest layouts - mine is at my new favorite coffee shop, working on open source. I discovered this place on a date with Wendy a couple of months ago. The nice thing about it is the distinctly Christian atmosphere. A good friend of mine and I meet here on Friday mornings for accountability. Well, since they hand out free wireless internet, I thought I'd drop by for my night out as well. Good coding atmosphere - I have a nice corner with a plugin for my laptop, so I'm good to go. 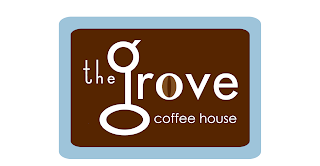 Check this place out if you're in DeSoto County, MS or the Memphis metro area anytime soon - http://grovecoffeehouse.com. I really enjoyed "The Toy Show" this morning. James Gosling went through a flurry of different demos from around the "cool" Java world. I was especially impressed with Project Wonderland (http://lg3d-wonderland.dev.java.net/), a virtual workplace environment, and with the real-time robotics demos. Unfortunately I was so sucked in that I didn't get any good photos. If anything you could call this my day on the back end. I attended four sessions, two of which were focused on that. I scheduled the first session because I thought it was be a good way to tie together all that I had learned about Grails and Rails and then compare it to my existing Java EE knowledge. As it turns out, the speaker believed that given tool support, the development experience wasn't all that different between the three. He then gave some performance comparisons, but I wasn't all that sure the analysis was very sound. Java EE came out way on top. I hadn't heard that it outperformed the others by quite as much as he showed. He made a rather dubious statement when he said that Grails and Rails weren't protected by standards. Groovy is a JSR and Grails just sits on top of it. If that isn't standard protection, then what is? The EJB tips, tricks, and patterns session was quite nice. I learned a few nuances of the platform. The patterns part was the best. They first went through some of the design patterns from the EJB 2.x days and identified which ones were obsolete and which ones were still useful. They then provided several new design patterns. Unfortunately the slides for this talk were not yet available and I just don't feel like combing through my handwritten notes. Definitely check this one out online when it is posted. Cameron Purdy's "Top 10" talk was both humorous and thought-provoking. I'll never do justice to it. Check it out when the video comes available. The final session of the conference for me addressed a burning question I had in my mind since Monday - what in the world is a DSL? I heard it thrown around in the Grails and Ruby talks at Java University, but nobody ever defined the acronym. Domain Specific Language - that what it is! I mainly attended this talk because I thought there might be applications for DSL's in our work at St. Jude. A DSL is a custom language designed for a specific purpose. Ruby's Rake language for instrumenting application builds is an example. Rob Harrop gave an impressive demo of how he built two DSL's, one providing a simpler API for JMX, and another for corporate action entitlement calculations. While I can't think of a direct application for DSL's yet, I'm not tossing out the possibility. JavaOne was a great conference for me. If I didn't hate to leave my family for this long, I'd love to attend every year. It's definitely drinking from a fire hydrant. I attended the first session simply to get a little more detail on all of the hype surrounding Ruby tooling support in NetBeans 6. What I got was even more than I bargained for. The project leaders actually walked us through not only the features that were available, but how they were implemented. I had never really thought about the problems with providing code completion and refactoring with a dynamically-typed language. It was really cool to see the thought process that went into their solutions. I'd love to hear a similar discussion from the JetBrains guys, as the Ruby support in IntelliJ IDEA is quite good as well. For me the second session was the best of the conference for me up until that point, and arguably it still is after attending Friday's sessions. Craig McClanahan, of Struts fame, was the main speaker and was joined by his colleagues Matthew Bohm and Jayashri Visvanathan. What made this session so good for me was that they presented a problem - "How can I add Ajax behaviors to my JavaServer™ Faces technology based application, without throwing away my investment in existing component libraries?" - and then provided three different solutions to that problem - low, medium, and high level. I was quite impressed with both of these frameworks. One of my colleagues is currently implementing Ajax behavior in a Facelets-based application using Ajax4JSF and he is quite happy with it. Dynamic Faces looked really awesome, especially its tooling support in NetBeans (actually I'm quite impressed with the overall JSF support in NetBeans - I'll definitely be adding it to my tool belt). The highlight of the presentation was Matt's video of him building an entire currency trading application in 28 minutes - except it was "fast-played" to finish in 3 1/2 minutes and set to techno music. Matt wowed us with his dancing abilities while we watched true RAD. The crowd went wild! I have to say that I was rather impressed by what I saw. The first talk was by Ben and Dion, the Ajaxian guys. It was an appropriate way to start, as they gave a quick history overview of Ajax. One nice point they made was that Ajax really isn't about the acronym - it never was - it's about building killer websites. Who cares what the actual technology behind it is. They discussed a couple of what they seemed to consider the better frameworks available - Dojo and ExtJS. They then explored some amazing up and coming features, including offline support and 2D client side graphics manipulation. The final talk was less informative for me, but only because I had experience with most of the technologies already. The killer part of this was how the speaker extended existing JSF components and added Script.aculo.us effects. It really made his version of Yahoo maps shine. Ajax isn't going anywhere but up. I just left yet another Ajax/JSF session, which for me was the best session of the conference so far. In a later entry I'll tell you why. It has been a whirlwind of a day. I've been to two keynotes (close to 5 hours of information there) and one technical session. Couple that information with what I heard at Java University yesterday, and you find many common themes. One that keeps coming up is the emerging trend of making other languages, particularly dynamic/scripting languages, first-class citizens on the JVM. According to Wikipedia, "Dynamic programming language is a term used broadly in computer science to describe a class of high level programming languages that execute at runtime many common behaviors that other languages might perform during compilation, if at all. These behaviors could include extension of the program, by adding new code, or by extending objects and definitions, or by modifying the type system, all during program execution. These behaviors can be emulated in nearly any language of sufficient complexity, but dynamic languages provide direct tools to make use of them." This definition seems to fit quite nicely with what I've heard the last two days. A couple of dynamic languages I've heard A LOT about are Groovy and Ruby. Yes, Ruby and its most popular framework, Ruby on Rails, have survived the initial hype. They are here to stay. Not only that, they seem poised to make a serious impact on the way we will do web application development over the next several years. Sun made a HUGE splash when they decided to hire the core developers of JRuby, the project which in its current pre-1.0 release already runs 98% of Ruby on Rails as a first-class citizen on the JVM. Not only that, you can now create a WAR file from a Ruby on Rails application and deploy it to any Java application server! I'll write more on this in another entry as I attended a full technical session on it. If you're too uncomfortable getting away from Java, why not try Groovy? After all, it is a JSR (241). All of Java syntax is legal in Groovy, plus a lot more. Groovy is a dynamic scripting language like Ruby and also compiles to bytecode, making it a first-class citizen on the JVM. It has its own MVC framework, Grails (formerly Groovy on Rails), which is a direct competitor to Ruby on Rails. I've already written on Groovy and Grails in an earlier entry. I plan to attend some additional sessions focused on these dynamic languages, as it seems they will be really important in the years to come. I'm currently sitting in this session - Graeme Rocher is the presenter. 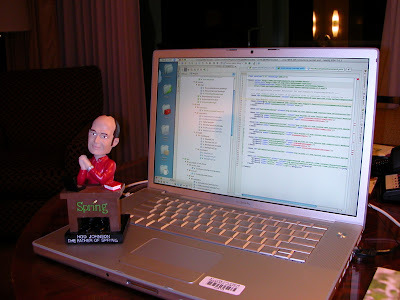 He is the creator of Grails, which is Groovy's answer to the Ruby on Rails like development experience. He's currently doing Q&A, so I thought I'd take the opportunity to write a short entry. So far this session is awesome! Graeme is a great presenter and has had the perfect balance of slides and live coding. Unfortunately they ran out of slides before I got to the presentation (more on the sometimes laughable logistics at JavaOne later), so I'm having trouble remember details to write about (they've promised to email me the slides). The first part of the session was an introduction to Groovy, Java's "scripting" language. I had NO IDEA just how cool and powerful Groovy was. I am especially impressed with its MetaClass concept, whereby you can override almost every behavior of the Java language that you can imagine - method calling, operator overloading, etc. Imagine being able to do AOP type things without using AOP. Not only that, it has all of my favorite pet features like "everything is an object," closures, dynamic lists, etc. It's an OOP nuts dream. I'll write more later. The reviews on Google Maps look promising! On a final note for this entry, I desperately miss my family. Our goodbye at Memphis International was tear-filled, especially by Wendy. I haven't been this far away from them in a LOOOOONG time. In fact, Abby was only about 10 months old the last time I went on a business trip without them. Isabella and Ali Kate weren't even conceived yet! I managed to get a web camera for the trip, so I'm going to send them a video message every day. Check your email sweetheart! I love you all SO MUCH!